One day last fall, molecular biologist Laura Landweber surveyed the Princeton University lab where she’d worked for 22 years. She and her team members had spent many hours that day laboriously affixing yellow Post-it notes to the laboratory equipment—microscopes, centrifuges, computers—they would bring with them to Columbia University, where Landweber had just been appointed full professor. Each Post-it specified the machinery’s location in the new lab. Items that would be left behind—glassware, chemical solutions, furniture, office supplies—were left unlabeled. As Landweber viewed the lab, decorated with a field of sunny squares, her thoughts turned to another sorting process—the one used by her primary research subject, a microscopic organism, to sift through excess DNA following mating. Rather than using Post-it notes, the creature, a type of single-celled organism called a ciliate, uses small pieces of RNA to tag which bits of genetic material to keep and which to toss. 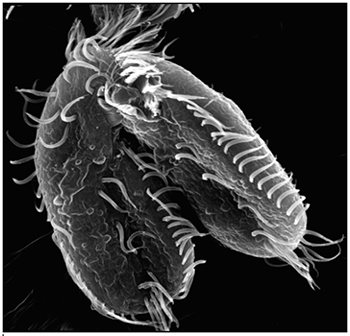 Landweber is particularly fond of Oxytricha trifallax, a ciliate with relatives that live in soil, ponds and oceans all over the world. The kidney-shaped cell is covered with hair-like projections called cilia that help it move around and devour bacteria and algae. Oxytricha is not only bizarre in appearance, it’s also genetically creative. Unlike humans, whose cells are programmed to die rather than pass on genomic errors, Oxytricha cells appear to delight in genomic chaos. During sexual reproduction, the ciliate shatters the DNA in one of its two nuclei into hundreds of thousands of pieces, descrambles the DNA letters, throws most away, then recombines the rest to create a new genome. Landweber has set out to understand how—and possibly why—Oxytricha performs these unusual genomic acrobatics. Ultimately, she hopes that learning how Oxytricha rearranges its genome can illuminate some of the events that go awry during cancer, a disease in which the genome often suffers significant reorganization and damage. Oxytricha carries two separate nuclei—a macronucleus and a micronucleus. The macronucleus, by far the larger of the two, functions like a typical genome, the source of gene transcription for proteins. The tiny micronucleus only sees action occasionally, when Oxytricha reproduces sexually. Two Oxytricha trifallax cells in the process of mating. Credit, Robert Hammersmith. These two human cells are nearly identical, except that the cell on the left had its nucleus (dyed red) removed. 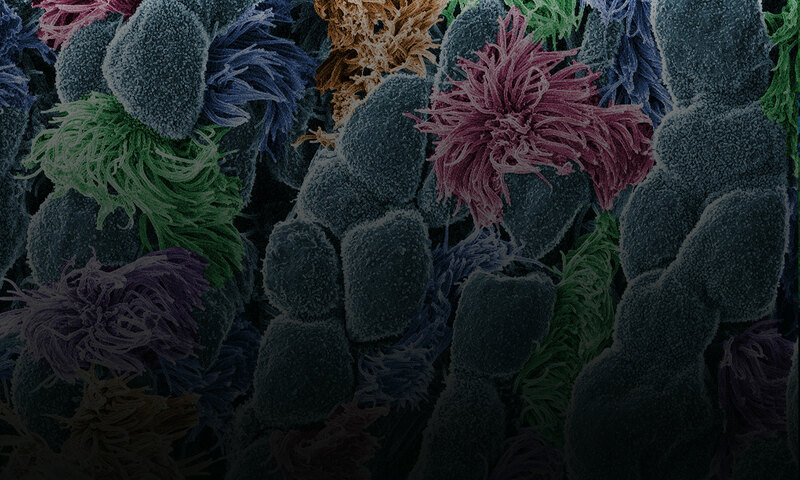 The structures dyed green are protein strands that give cells their shape and coherence. Credit: David Graham, UNC-Chapel Hill. Both of the cells above can scoot across a microscope slide equally well. But when it comes to moving in 3D, the one without the red blob in the center (the nucleus) stalls out. That’s sort of like an Olympic speed skater who wouldn’t be able to perform even a single leap in a figure skating competition. Scientists have known for some time that the nucleus is involved in moving cells across a flat surface—it slides to one side of the cell and “pushes” from behind. However, scientists have also shown that cells with their nuclei removed can migrate along a flat surface just as well as their brethren with intact nuclei. But they had no idea that, without a nucleus, a cell could no longer move in three dimensions. This discovery was made by UNC-Chapel Hill biologists Keith Burridge and James Bear and their colleagues. These NIGMS-funded researchers also observed that cells whose nuclei had been disconnected from the cytoskeleton could not move through 3D matrices. The cytoskeleton is the microscopic network of actin protein filaments and tubules in the cytoplasm of many cells that provides the cell’s shape and coherence. It has also has been thought to play a major role in cell movement. The gray, stringy background of these videos is a 3D jello-like matrix. The cell in the top half of this video has a nucleus and can migrate through the matrix. Both cells in the bottom half have been enucleated (a fancy term for having its nucleus removed) and cannot travel through the matrix. Credit: Graham et al., Journal of Cell Biology, 2018. The researchers speculate that the reason cells without nuclei (or those whose nuclei have been disconnected from the cytoskeleton) don’t navigate in 3D has to do with complex mechanical interactions between the cytoskeleton and the nucleoskeleton. The nucleoskeleton is a molecular scaffold within the nucleus supporting many functions such as DNA replication and transcription, chromatin remodeling, and mRNA synthesis. The interface between the cytoskeleton and nucleoskeleton consists of interlocking proteins that together provide the physical traction that cells need to push their way through 3D environments. Disrupting this interface is the equivalent of breaking the clutch in a car: the motor revs, but the wheels don’t spin, and the car goes nowhere. A better understanding of the physical connections between the nucleus and the cytoskeleton and how they influence cell migration may provide additional insight into the role of the nucleus in diseases, such as cancer, in which the DNA-containing organelle is damaged or corrupted. This research was funded in part by NIGMS grants 5R01GM029860-35, 5P01GM103723-05, and 5R01GM111557-04. The stunning pigmentation of tigers, the massive jaws of sharks, and the hyper-acute vision of eagles. These and other remarkable features of higher organisms (vertebrates) derive from a small group of powerful cells, called neural crest cells, that arose more than 500 million years ago. 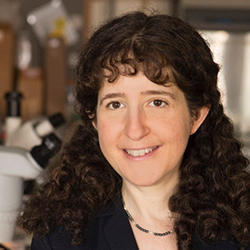 Molecular biologist Carole LaBonne of Northwestern University in Illinois studies how neural crest cells help give rise to these important vertebrate structures throughout development. Very early during embryonic development, stem cells differentiate into different layers: mesoderm, endoderm, and ectoderm. Each of these layers then gives rise to different cell and tissue types. For example, the ectoderm becomes skin and nerve cells. Mesoderm turns into muscle, bone, fat, blood and the circulatory system. Endoderm forms internal structures such as lungs and digestive organs. These three layers are present in vertebrates—animals with a backbone and well-defined heads, such as fish, birds, reptiles, and mammals—as well as animals without backbones, such as the marine-dwelling Lancelets and Tunicates (referred to as non-vertebrate chordates). Unlike cells in these layers, neural crest cells, which are found only in vertebrates, don’t specialize until much later in development. The delay gives neural crests cells the extra time and flexibility to sculpt the complex anatomical structures found only in vertebrate animals. Scientists have long debated how neural crest cells manage to finalize their destiny so much later than all other cell types. Using the frog Xenopus as a model system, LaBonne and her colleagues performed a series of experiments that revealed the process and identified key genes that control it. In this video, LaBonne describes the power of neural crest cells and how they can be useful for studies of human health, including how cancer cells can metastasize, or migrate, throughout the body. Dr. LaBonne’s research is funded in part by NIGMS grant 5R01GM116538. About 10 years ago, University of Utah geneticist Mark Yandell developed a software platform called VAAST (Variant Annotation, Analysis & Search Tool) to identify rare genes. VAAST, which was funded by NHGRI, was instrumental in pinpointing the genetic cause of a mystery disease that killed four boys across two generations in an Ogden, UT family. NIGMS has been supporting Yandell’s creation of the next generation of his software, called VAAST 2, for the past few years. The new version incorporates models of how genetic sequences are conserved among different species to improve accuracy with which benign genetic sequences can be differentiated from disease-causing variations. These improvements can help identify novel disease-causing genes responsible for both rare and common diseases. Yandell and his colleagues in the Utah Genome Project recently took part in a panel at the Sundance Film Festival called the “Genetics of Storytelling” to discuss film’s ability to convey the power of science and medicine. Yandell told the audience his story about his efforts to use VAAST to trace the Ogden boys’ genetic variation back to their great-great-great-great-great grandmother.